Newly completed, the build quality and the owners attention to detail has resulted in a home where the term "casual luxury" actually makes sense. 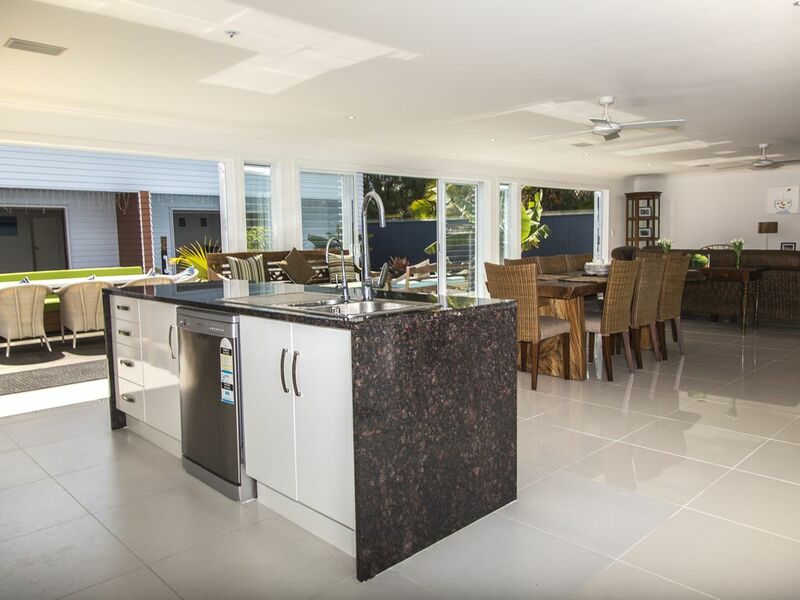 Through the front door, the home opens up to an expansive newly furnished kitchen, dining and living area, the opposite wall is all glass sliding doors which open up to the pool, BBQ area and outdoor dining and sun lounging areas. Across the way are the two very very big master bedrooms that look out over the pool, each has its own four poster king size bed, ensuite, lounge area, flatscreen, and also kids rooms. The kids rooms are accessed via the master bedrooms, each room has a single bed with a pull out divan underneath. The kids have their own little balcony area, and right next door is a massive playing field (Takitumu School). 10 Green Bottles is extremely private, the whole home is fully fenced, and has ceiling fans throughout the whole complex. 5 minutes in either direction will get you to Muri and the main township. The home will comfortably take 8 people and is ideal for two families or two couples on holiday together. Once settled in, the likelihood of going anywhere will be very remote there will be 10 very cold green bottles waiting for you in the fridge. Enjoy! I recommend transfers to and from the home, they re NZ$40.00 return or NZ$20.00 one way for adults and NZ$20.00 return or NZ$10.00 one way for kids under 12. There are not a lot of street names or signage or road lighting here in Rarotonga, and maps don t work well here, people often struggle to find the home. Just let me know and I can adjust the price after confirmation. The house has a BlueSky Hotspot, to access it you need to open your browser, it will default to the Cook Islands BlueSky page, in the lower left corner, you’re able to buy a data package (they’ll send you a username and password). 10 Green Bottles provides comfortable and stylish indoor and outdoor eating! Indoor just off your kitchen area is a large dining table seating 8 people.